BASEBALL is a pattern overload sport, meaning the same movements are replicated thousands of times throughout a season. Since baseball is a one-sided sport, this PATTERN OVERLOAD has the tendency to create muscle imbalances, often times leading to injury and decreasing overall performance. Baseball players often throw and swing from the same side of their bodies, because of this, muscle imbalances will inevitably occur over the course of the season if you fail to take preventative measures. The stresses and loads specific to the game of baseball expose players to a few common biomechanical dysfunctions and muscular imbalances. Here are a few common problems that baseball players encounter, with suggestions on how to correct them. The key to shoulder health and throwing performance is building strong, resilient scapular and posterior shoulder muscles. 17 muscles stabilize the scapula, creating synergistic co‐contraction to stabilize the shoulder complex and guide movement. Decreased shoulder complex neuromuscular control. CLICK HERE for a complete J-BANDS™ routine to help build strong scapular and posterior shoulder muscles. All rotational athletes need adequate thoracic spine (upper back) mobility in order to create appropriate separation during throwing motions and changes of direction. Throwers who lack thoracic mobility, primarily rotation, often have issues with scapulo-thoracic mechanics during the pitching or throwing motion which will inevitably place stress on the anterior shoulder. There is no doubt that baseball players and other overhead athletes get tight from throwing. Over the course of a season your muscles tend to tighten and loss of mobility ensues. The deceleration component of the throwing motion exposes the posterior rotator cuff to extreme eccentric workloads. Simple strategies to maintain tissue and movement quality of the posterior shoulder motion can be effective and can prevent loss of motion and injury, while enhancing throwing performance. In our baseball performance programs, we recommend the use of soft tissue techniques focusing on a few key areas like the posterior rotator cuff, lats, and pecs. One of the biggest problems throwers face is scapular and shoulder dysfunction. More specifically, issues related to inadequate protraction and upward rotation of the scapula. The tendency to lose shoulder and scapular mobility (primarily upward rotation) occurs due to the stress of the throwing motion disrupting the force couple between the upper trap, lower trap, and the serratus anterior. This rotation is essential to maintain proper shoulder joint centration while performing high velocity movements. Increased external rotation is correlated with increased throwing velocity. Improving this range of motion is helpful for lighting up the radar gun. However it’s important to note that this added external rotation comes the possibility of anterior shoulder instability and a loss of internal rotation. In many cases, throwers tend to have decreased internal rotation of the shoulder. This is often a result of excessive external rotation which is necessary for a throwing shoulder to perform at an elite level. A small decrease in internal rotation in the throwing shoulder is normal in throwers, however if its excessive, it can become a risk factor. Glenohumeral Internal Rotation Deficit (GIRD) refers to a pathological loss of internal rotation in the throwing shoulder compared to the non-throwing shoulder. We can avoid this by preserving as much total shoulder range of motion as possible using the following techniques. The hips of a thrower are subject to loss of internal rotation mobility especially in a pitcher’s front stride leg. This decrease in mobility that occurs over the course of the season can cause compensatory movement patterns as well as stress on the front of the shoulder and elbow when throwing. Because most players either throw and bat from one side exclusively, there is an obvious tendency for some sort of imbalance. You can’t perform 5,000 right-handed throws and zero left-handed throws during a season and not expect your body to compensate in one way or another. The best way to prevent this from becoming detrimental to your development and performance is to include unilateral training techniques to improve your proprioception and body control. 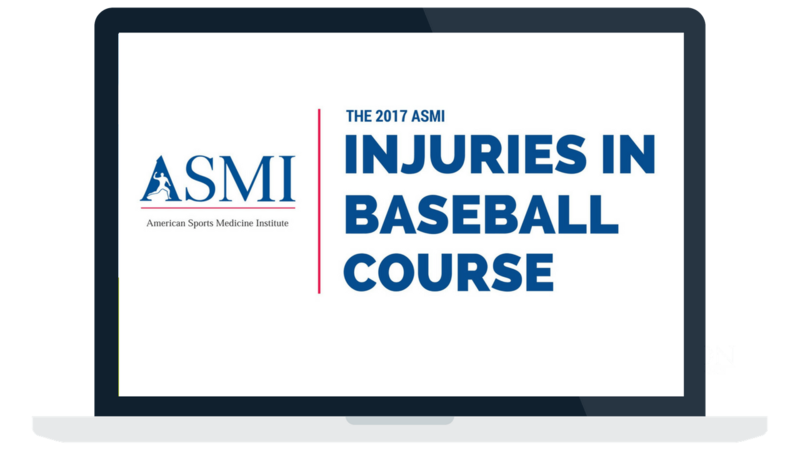 One of the foundational pillars of any program for baseball players is an arm care program. Yet, this is often one of the most neglected areas I’ve seen. Many collegiate baseball players, let alone high school and youth baseball players, have never performed an appropriate arm care program. Here’s a simple fact… If you are a baseball player, you must be performing an arm care program. All the big leaguers do, why aren’t you? More importantly, if you are performing a strength training program, getting pitching lessons, or participating in a long toss or weighted ball program and do NOT perform an arm care program, your priorities are reversed. I always say, you are focusing on the frosting before you’ve baked your cake. But I get it, some people have never heard of an arm care program and some people do not have access to a good one. Well, I want to change that. Our mission here at Elite Baseball Performance is to advance the game of baseball through trustworthy and scientifically proven information and programs. I want every baseball player in the world to perform an appropriate arm care program, that’s why I am giving mine away for free here at EBP. I’ve developed this program over the course of two decades based on the science of throwing a baseball and the science behind exercise selection. This is the foundational program that we have used at Champion PT and Performance on everyone from Little League pitchers to Cy Young winners. Sure, the programs we do with our athletes in person are far more comprehensive, but I consider this to be the mandatory foundational program you should be performing. In exchange, I only ask for your help spreading the word. Please share this page with all your friends, teammates, coaches, parents, and anyone else that wants to help baseball players enhance their performance while reducing their chance for injury! Start performing this today and you will be well ahead of the curve. Countless big leaguers perform this exact program, get it here for free today! The two most commonly reported areas of pain in baseball players are the shoulder and elbow. However, the area in pain may not actually be causing the pain itself. The body is a chain and weakness in one link of that chain can cause pain in another area. This is certainly the case when it comes to arm pain. Often when pain is felt in the arm it is due to a lack of mobility elsewhere in the body. That “elsewhere” is often from the scapulothoracic joint. In order to understand the importance of the scapulothoracic joint, which is comprised of the scapula (shoulder blade) and the rib cage, we have to appreciate the functional. The shoulder joint is made up of the head of the humerus and the glenoid cavity of the scapula. The humeral head sits right on top of the glenoid cavity like a golf ball on a tee. As the shoulder joint goes through various motions, the scapula has to move with it. It does this by gliding on top of the rib cage. For every two degrees that the shoulder moves, the scapula should move one degree (2:1 ratio). If the scapula is unable to move close to a 2:1 ratio with the shoulder, then we are going to be limited with how far we can move our arm. This limit, when trying to throw a baseball, is problematic, as the thrower will place undue pressure on the shoulder and elbow in an attempt to reach the proper range of motion. As you can see, it’s pretty important to not just focus on the arm, but also the scapula. Below are my four favorite correctional exercises to develop scapulothoracic movement. In addition to mobilizing the thoracic spine, the lying half moon stretch is exceptional at promoting scapulothoracic range of motion. Have the athlete flex their top knee at 90° and sit it on top of either a medball or a foam roller. This will keep their spine aligned properly. The athlete should try to drag their fingers along the ground as they progress throughout the motion. It is important to note that athletes who lack ST mobility will not be able to get their hand all the way to the ground initially. As the athlete moves their arm through the motion the scapula will go through all of its movement patterns. For baseball players it is critical that the scapula is able to elevate and upwardly rotate as the arm extends forward towards ball release. This drill is an example of how an assessment test can also be used as a corrective exercise. Have the athlete stand with their feet 4-6 inches away from the wall and cue them to keep their back completely flat against the wall. With the amount of lumber extension we see across the population this may be very challenging for some athletes. If the athletes cannot keep their lower back flat on the wall, instruct them to bend their knees and active their core. As the athlete slides their hands up the wall they are getting more elevation and upward rotation of the scapula; but as they pull their hands off of the wall, they’re going to retract the scapula and get some slight posterior tilt as well. Make sure that athlete engages their core and doesn’t fall into lumbar extension as they bring their hands off of the wall as this should be an exclusively scapulothoracic movement. The last exercise in my scapulothoracic joint mobilization series is very similar to the classic Blackburn’s exercises. I prefer to have athletes do these exercises unilaterally and on a table because when done bilaterally and on the floor we often see more spine movement than actual ST movement. This is another good exercise for developing posterior tilt of the scapula by allowing the lower trap to get involved. The beautiful thing about all of these exercises is that they require very little to no equipment at all. This means that athletes can do these exercises in the gym, on the field, or at home. Give these scapular exercises for baseball pitchers a try and keep that arm healthy this season! Want EBP’s FREE Arm Care Program?